A craniotomy is a surgical procedure to open the skull. 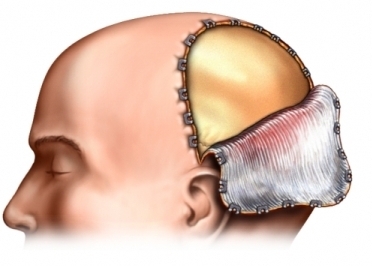 A part of the skull, called a bone flap, is removed to gain access to the brain for other procedures. In most cases, the bone flap is replaced after the procedure is finished. Craniotomies vary in size depending on what the problem is. Talk to your doctor about any medications, herbs, or supplements you are taking. You may need to stop taking some medications up to 1 week before the procedure. General anesthesia —Used for most craniotomies. You will be asleep during the surgery. Local anesthesia—Used for stereotactic craniotomies. This blocks around the surgical site from pain, but you will still be awake. General anesthesia is used to start awake craniotomies. Once the brain is exposed, the effects of anesthesia are slowly reversed. This is done so you can interact with the surgeons during the procedure. This helps them map the brain and determine which parts of the brain are critical for functioning. Your head will be shaved and your skin will be washed with an antiseptic. An incision will be made into part of your scalp. Next, part of your skull will be removed and your brain covering will be opened. Depending on the reason for your surgery, several things may happen: a tumor may be removed, a part of your brain tissue may be taken, a tube may be placed, or repairs to your brain or its vessels may be done. The brain opening will then be sewn back into place and your skull replaced. Staples or stitches will be used to close the incision. A drain may be inserted to remove blood and fluid for the first few days after surgery. A dressing will be wrapped around your head. The usual length of stay is 3-7 days. It is possible that you may have to stay longer if complications arise. Right after the procedure, you will be in a recovery room where your blood pressure, pulse, breathing, and mental status will be monitored. The staff will take measures to prevent pressure build-up in your brain. You will be asked to get out of bed and walk around to prevent complications like blood clots or pneumonia . Continue with your physical therapist’s exercise program. If you feel symptoms of depression for more than 2 weeks, consider talking to a therapist or psychologist. Awake craniotomy treatment. University of Miami Health System website. Available at: http://neurosurgery.med.miami.edu/clinical-subspecialties/brain-tumors/awake-craniotomy-treatment1. Accessed November 9, 2017. Craniotomy. Johns Hopkins Medicine website. Available at: https://www.hopkinsmedicine.org/healthlibrary/test%5Fprocedures/neurological/craniotomy%5F92,p08767. Accessed November 9, 2017. Guide to the care of the patient with craniotomy post-brain tumor resection. American Association of Neurological Nurses website. Available at: http://www.aann.org/pdf/cpg/aanncraniotomy.pdf. Accessed November 9, 2017. Hydrocephalus in children. EBSCO DynaMed website. Available at: https://www.dynamed.com/topics/dmp~AN~T474411/Hydrocephalus-in-children . Updated April 28, 2017. Accessed November 9, 2017. Lukas RV, Mrugala MM. Pivotal therapeutic trials for infiltrating gliomas and how they affect clinical practice. Neuro Oncol Pract. Available at: https://doi.org/10.1093/nop/npw016 [EPub ahead of print]. Accessed November 9, 2017. Young JS, Chmura SJ, Wainwright DA, et al. Management of glioblastoma in elderly patients. J Neurol Sci. 2017;380:250-255. Your surgery guide: Information about your craniotomy or biopsy for a brain tumor. Cedars Sinai Medical Center website. Available at: http://www.braintumortreatment.com/What-to-Expect/The-Treatment-Experience/Your-Surgery-Guide.aspx. Accessed November 9, 2017. 6/3/2011 DynaMed's Systematic Literature Surveillance https://www.dynamed.com/topics/dmp~AN~T114315/Smoking-cessation-list-of-topics : Mills E, Eyawo O, Lockhart I, Kelly S, Wu P, Ebbert JO. Smoking cessation reduces postoperative complications: a systematic review and meta-analysis. Am J Med. 2011;124(2):144-154.e8.